Jonas Knudsen rescued a point for out-of-sorts Ipswich with a last-gasp equaliser in a dire 1-1 draw at home to Fulham. The left-back scored his first goal for Ipswich in stoppage time after it looked like Moussa Dembele's 17th of the season would be enough to claim all three points for Fulham. It took Ipswich 72 minutes to register a shot at Marcus Bettinelli's goal but it mattered little after their late equaliser in a game where they barely deserved anything. With neither side having anything of note to play for, chances were always at a premium. A poor opening half hour threatened to liven up when Fulham almost scored out of nothing. A simple through-ball by Lasse Vigen Christensen dissected the centre of the Ipswich defence to release Ryan Tunnicliffe, who got to the ball ahead of Knudsen but his poked low shot was pushed away by the diving Bartosz Bialkowski. Fulham were still carving out the game's only chances, Dembele holding off the challenges of Tommy Smith and Jonathan Douglas but shooting wildly over from inside the area with six minutes remaining of a forgettable first half. The second half started little better, Richard Stearman firing a difficult chance over the bar on 54 minutes from Ross McCormack's corner. 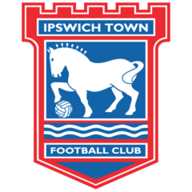 Ipswich had still failed to produce a single shot, on or off target, and they almost fell behind shortly after the hour mark from another dangerous McCormack corner, met firmly by Shaun Hutchinson whose header was brilliantly tipped over by Bialkowski. As the home fans grew more and more restless at the lack of penetration in the final third, Fulham took the lead. Scott Parker was released down the right-hand channel and his pass inside was perfect for Dembele to drill the ball beyond the helpless Bialkowski. Finally, with 18 minutes to go, Ipswich mustered a shot at Bettinelli's goal - substitute Kevin Bru firing wide from 25 yards, an effort which resulted in ironic and loud cheers from the Town fans. Moments later, Dan Burn headed another corner just wide as Fulham threatened to add to their lead and deepen the gloom around Portman Road. The game was finally coming to life, Brett Pitman's 20-yard shot being tipped round the post by Bettinelli as the Fulham keeper finally got his gloves dirty in the 74th minute. With four minutes left, Pitman had the ball in the net but David McGoldrick was adjudged to have handled in assisting his strike partner before the Town number 10 saw his great shot from distance denied by the diving Bettinelli. The breakthrough finally came in stoppage time when McGoldrick cleverly played in Freddie Sears and his low cross was rifled in by Knudsen.